How often do you walk into a lounge only to find there's nothing on the menu that can help your body create strong bones, muscles, teeth, hair and nails? Like, pretty much every time you go out, right? 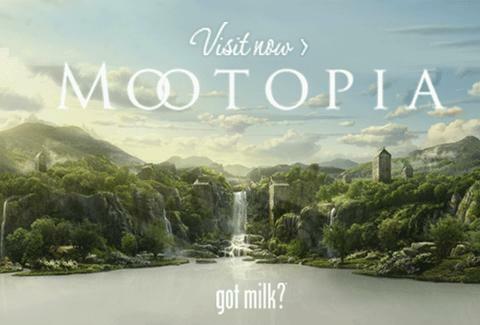 Clearly, you need to saunter into the Mootopian Oasis: an experiential lounge set up Golden State-wide by The California Milk Processor Board, creator of GOT MILK?, the most iconically healthful motto since "THAT WOOLLY MAMMOTH HAS BEEN IN THE SUN A WHILE -- MAYBE IT'S BEST NOT TO EAT IT?" Bringing the benefits of Nature's most perfect sustenance to sun-drenched locales like Broadway Plaza in Walnut Creek, River Park Mall Pop-Up in Fresno, and the CA State Fair in Sacramento, the Oasis will host a complimentary milk bar refreshingly stocked with smoothies, t-shirt and other swag giveaways, an arm-wrestling post for conducting strength competitions, and a hair & manicure station, because true strength is admitting that your cuticles need some work. To find out the Where, When, and What behind the Mootopia Oasis, just hit visitmootopia.com -- if you've GOT FIVE MINUTES, it could change your life forever.